With the end of summer can often come a feeling that the season for fun is done for the year. That doesn’t have to be the case, however. Sure, the kids have gone back to school, but there are still weekends for you to sneak in some family fun. And, while the weather might be cooling off, there are things you can do which aren’t totally dependent on a bright and sunny day. To keep you in the mood for family enjoyment as fall settles in, we have provided a list of five fall fun ideas below. Going to the zoo is a time-honored tradition for many families. Kids naturally love seeing animals, so this is a safe bet when you want to get out and enjoy a day together. The nice thing about going to the zoo in the fall is you are likely to find it less crowded than it is during the summer months. As long as you pick a day where the weather is reasonable, and you dress appropriately, you should be able to have a great time exploring and viewing everything the zoo has to offer. If you need to take your activities inside for the day to escape some poor weather, consider paying a visit to your local bowling alley. 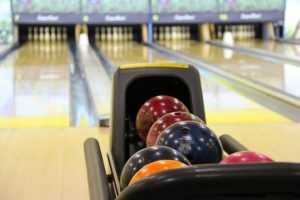 Bowling as a sport is not as popular as it once was, but kids can still get a thrill out of rolling the ball down the lane toward the pins. Ask the staff at the alley to put the ‘bumpers’ up if you have young kids who are having trouble keeping the ball out of the gutter. As Halloween approaches, pumpkin patches start to pop up in many locations. If you aren’t sure if there are any near you, a quick internet search should provide the answer. Kids will love walking through the field to pick out their favorite pumpkin, and many of these locations have other attractions such as rides, games for kids, snacks, and more. Depending on where you live, it may be possible to find a great hike for the family to take on a nice day. If you have trees which change color and lose their leaves in the fall, this would be a great way to get outside and enjoy nature – and it will probably be free, as well. Of course, check the weather carefully before heading out and bring the right supplies for the day. You don’t have to go out of the house in order to have fun with the family. On a cold night, consider staying in, making a few snacks, and watching a movie together. Before starting the movie, put away all phones, tablets, and other devices so you can just watch and enjoy. You might find that everyone enjoys this kind of evening so much that it winds up becoming a tradition. What do you do for fun in the fall? Have you used any of these activities with your family? I love this time of year! Summer here in Charleston is sometimes just TOO HOT to do much outside. But now we can really take advantage of the parks, events, and other low-cost activities!